Meet this Wood Elf who wants you to donate vast sums of money. Speak to Gaenor in the Temple Courtyard. He will ask you for 50, 100, 1000, 10,000, and 1,000,000 gold in turn. Refuse or pay (it won't change the outcome). Wait for two days and return to the courtyard. Kill the now hostile Gaenor. Speak with Gaenor in the Temple Courtyard about the small favor he wishes to ask of you. He tells you that he is down on his luck and wants you to give him 50 gold to help him get back on his feet. If you agree, he'll take the 50 and then ask for 100. If you agree, he'll then ask for 100, and then 1000, 10,000, and finally one million. If you attempt to give him more gold than you are carrying, he ask you for ebony and then Daedric weapons and armor. If you don't have the items he wants, he will then get very upset and refuse to speak to you further. If you refuse to give him the gold it will take some convincing to make him realize that you won't give him anything, and then he'll likewise refuse to speak with you. Similarly, if you do actually offer to give him the one million gold (or full suit of Daedric amor) he eventually asks for, he'll get angry and accuse you of mocking him, saying that no one would possibly have that much cash on them. Regardless of what you do, he will eventually get angry and end the conversation, so to save yourself time and money, it's best to just refuse him from the outset and give him nothing. If you attack him, he will immediately teleport out of the area. After you speak with him (or attack him), Gaenor will disappear. After two days, he will return to the same spot, this time wearing a complete set of ebony armor and Gaenor's Amulet, and with a grudge. He will decry for you offending him and attack you. Be prepared for the ensuing fight, as he is one of the toughest opponents in the game. He has extremely high Health, tough armor, and a variety of abilities, including very high (~85%) Reflect and Resist Magicka, constant health regeneration, and incredibly high (770) Luck, which makes him very difficult to hit. An easy way to kill Gaenor is to use the power of Sujamma. Every bottle will increase your strength by 50 points for 1 minute and drinking a lot of them at the same time will increase your strength so much that you can kill Gaenor in just a few hits. You can buy a lot of bottles from Fara in Sadrith Mora or even from the Mudcrab merchant (but they will be more expensive, from him, since you can't use your Disposition or Mercantile to lower the price). They will both have an infinite restock of Sujamma and you just need to close and reopen the exchange window to reset the stock levels. 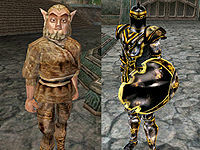 Use Sujamma to increase your strength up to at least 1000 (the more the better) and you should be able to kill Gaenor with any weapon in a few hits. 20 I attacked Gaenor, and he vanished before my eyes. Perhaps he teleported somewhere. 30 I have again run into Gaenor, whose good luck has done wonders for him. He remembers me, though, and doesn't like me. 40 Finishes quest I have killed Gaenor. This page was last modified on 27 October 2018, at 04:34.